Since Meryl Streep has been nominated for an Oscar for the 18th time, we thought we’d celebrate by recounting her best work in film. Let’s do this! Surprise, surprise! In case you ever doubted that Meryl Streep is a magical unicorn made of glitter, sent from the heavens by an omnipotent being, this will clear up the confusion! The 86th Academy Award nominations have been announced, and the 64-year-old actress has nabbed her 18th nomination for her role in August: Osage County, concreting her position as the most-nominated movie star in Oscar history. The only actors straggling behind are Katharine Hepburn and Jack Nicholson, with 12 nominations each. 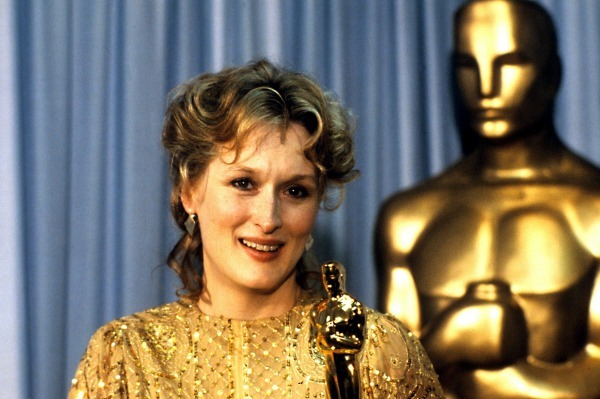 Let’s repeat that again: Streep has been nominated for an Oscar 18 times! Thus far, she’s won three of those times. We’re pretty sure she exists solely to set the bar for other actors and for all of humanity in general. Despite feeling slightly inept at living, we’d like to send our “hurrah!” to Streep and mark the occasion with a countdown of her best films. We must admit we are suckers for a Woody Allen film. This one’s a very complicated story about Isaac (Allen), who is dating 17-year-old Tracy before falling in love with his friend’s mistress, Mary (Diane Keaton). Streep plays Allen’s ex-wife. It’s an awkward, quirky film, as is Allen’s tradition. We love it. Best. Animated. Film. Ever. Fantastic Mr. Fox is based on a children’s book by Roald Dahl, about a rowdy Mr. Fox (George Clooney) who enjoys the thrill of outsmarting daft farmers, much to the dismay of his wife, Felicity (Streep). This movie is cute, eclectic and hilarious. This film might leave you scratching your head and in love at the same time — be warned. It tells a story of a fictionalized Charlie Kaufman (Nicolas Cage), who is trying to adapt Susan Orlean’s (Streep) The Orchid Thief into a screenplay but cannot get past a serious writer’s block. It’s a very twisted film and a story within a story (you’ll have to watch it to understand). A definite must-see. Symbolizing a cultural shift that took the stigma out of divorce in the 1970s, Kramer vs. Kramer follows Ted (Dustin Hoffman) and Joanna Kramer (Meryl Streep) as they decide to part ways. Streep received her first Oscar for this role. Great film! This is a classic, centred on the friendship of Mike (Robert De Niro), Nick (Christopher Walken) and Steven (John Savage) as they are shipped off to war in Vietnam. Streep plays Linda, Nick’s fiancée and Mike’s secret love interest. Chilling movie, but worth a watch or two! This film really brought everyone’s attention to Anne Hathaway, who played fresh-faced college graduate Andrea, who comes to work as a personal assistant to Miranda Priestly (Streep) of Runway fashion magazine. Streep’s performance was spot on as the distant, snobbish editor-in-chief of Runway. Great movie to watch with your girlfriends. Which film do you think is Streep’s best?